The DuraLiner system is a high temperature, double wall, all fuel chimney liner system and protects masonry chimneys from damaging flue product condensation. This liner is factory insulated and needs no extra wrapping. This Extend-a-Cap kit is used to create the secure top termination of DuraLiner at the top of the masonry chimney. 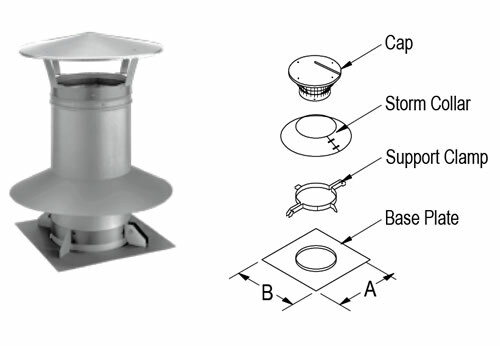 The kit includes a base plate, a support clamp, a storm collar, and a cap with an integrated spark arrestor. The kit is available in diameters of both 6" and 8".